De nouvelles images sont en ligne sur mon site. Il s'agit de montrer quelques-uns des hommes et femmes qui, dans l'ombre, ont participé à la réussite du défilé aérien au-dessus de Bruxelles le 21 juillet dernier. La plupart des médias ont davantage montré les avions et les pilotes. Mais sans le travail effectué par le personnel technique en piste ou dans les hangars de maintenance, rien ne serait possible. Voici quelques images et portraits réalisés à Melsbroek lors de la conférence de presse du 19 juillet et le 21 juillet lors du défilé aérien. Bien entendu, je tiens particulièrement à remercier l'équipe de COMOPSAIR/IPR pour la qualité de son accueil, son habituelle efficacité ainsi que pour les facilités accordées lors de ces deux journées. Vous trouverez tout naturellement ces nouvelles images réparties sur mon site dans la catégorie Équipages. Ces photos complètent l'article publié par SBAP la semaine dernière et dans lequel vous trouverez plusieurs de mes photos et 1 vidéo réalisés par mes soins. Voici le lien de l'article : http://www.sbap.be/events/2012/027belnatday2012/027belnatday2012.htm. Un tout grand merci à Monsieur Pierre Deprez pour toutes les facilités accordées pour la réalisation de ces reportages sur l'aérodrome de Valenciennes. Et, last but not least, des remerciements tous particuliers aux pilotes et techniciens des Red Devils pour la simplicité et la cordialité de leur accueil. Les 8 et 9 septembre , la Fraternelle " The White Bison " organise un weekend " Portes Ouvertes " dans ses locaux , rue de Velroux ( ancienne base militaire), aire nord à Bierset. En attache l'affiche publicitaire, que vous pouvez transmettre vers vos connaissances , imprimer et afficher. Merci d'avance de faire notre pub. The AVRO CF-100 was the first conventional winged aircraft to break the sound barrier. Designed and made in Canada. On December 18, 1952, S/L Janusz Zurakowski, the Avro company chief development test pilot, took the CF-100 Mk 4 prototype to Mach 1.0 in a dive from 30,000 ft. being the first straight-winged jet aircraft to achieve controlled supersonic flight. Canada's physicists and aeronautical engineers were laid of from AVRO and went to work for NASA and gave their expertise there for the space program. Canada really was armed to the teeth and truly was a superpower back then (with help from the British from the Spitfire and Hurricane evolutions after WWII). AVRO was Canada's largest aircraft manufacturer, and in its prior form of Victory Aircraft Ltd. in WWII and earlier, was a cover company for top secret research. Purposely funded by Great Britain, Canada was once destined to be THE superpower of the world in aeronautics. It's a shame what happened to this plan. Proud to be a Canadian engineer. un Fly In (privé) Oldtimers à Colmar-Houssen. présentation-inscription de ce Fly In. ÉRIC JANSSONNE, Président " Les Ailes Historiques du Rhin "
Most of the the time modern fighter demonstration focus on demonstration of force and power. What I appreciate with the new F-16 solo display of the Belgian Air Force is the demonstration of precision flight and how the airplane answer to the control of the pilot. 25 Brussels Airlines flights are departing from 17 different cities today to bring more than 2,000 passengers from Europe and far beyond to Brussels Airport. All these passengers have the same destination: Tomorrowland. On Monday 30 July they will all return home after a weekend of partying at the festival in Boom.. Those flying in from Barcelona were surprised during the flight by a unique live DJ set by Dimitri Vegas & Like Mike and Yves V.
Tomorrowland noticed a growing demand from people abroad wanting to visit the festival and decided to enter into a partnership with Brussels Airlines. Attractive travel packages were put on offer, including flight, festival ticket and hotel accommodation or tickets for the DreamVille camping. The concept proved to be a success: the packages were sold out in a matter of hours.Today more than 2,000 passengers landed at Brussels Airport, coming from NYC, Rome, Madrid, London, Stockholm, Prague, Geneva, Barcelona, Milan, Berlin, Manchester, Copenhagen, Porto, Budapest, Bilbao, Lisbon and Moscow on Brussels Airlines flights. The first flight, originating from NYC, landed at 6h25 and the last one, coming in from London, lands tonight at 20h05. Upon departure, the passengers checked in at a Tomorrowland desk and were accompanied by special hostesses. When they arrived at Brussels Airport, friendly Tomorrowland hostesses were again on hand to welcome them. 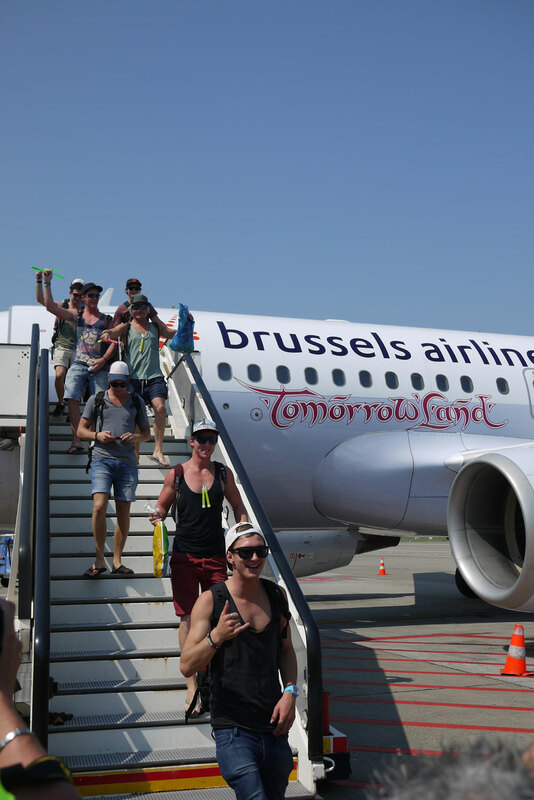 From there, they left for the hotel or DreamVille by Tomorrowland transport. After the festival, on Monday 30 July, the passengers will be brought back to Brussels Airport. DJ duo Dimitri Vegas & Like Mike and Antwerp DJ Yves V surprised the passengers who departed from Barcelona with a DJ set on board. The DJs played a set at an altitude of more than 10,000 metres to warm up the enthusiastic crowd of 140 passengers and to set the tone for three fantastic days at Tomorrowland. Upon arrival at DreamVille they were able to continue the dancing to the beats of The Gathering, the traditional DreamVille party that takes place the day before the festival opens. At Tomorrowland, Brussels Airlines will bring the visitors' heads in the clouds for a brief moment: the main attraction at Tomorrowland 2012 is Europe’s tallest ferris wheel : The Brussels Airlines Cloud Rider. Nearly 60 metres high, the wheel was brought in from Düsseldorf and 20 mechanics were responsible for constructing it. The 40 pods can each hold 8 passengers at a time, meaning 2,200 passengers per go. Thanks to Brussels Airlines, all Tomorrowland visitors will be treated to a free ride on the wheel. The personal code on their special Tomorrowland boarding pass also gives them a chance of winning some really great flight prizes, including one year of free flights with Brussels Airlines. On Friday 27 July at 12.00, the festival starts. The organisers are expecting 180,000 visitors and 35,000 DreamVille guests. The festival ends at midnight on Sunday 29 July. This year, those who stay at home can also enjoy the festival thanks to Tomorrowland TV: seven hours of live television on the Tomorrowland YouTube channel with live sets, interviews, extras and the all-important look behind the scenes. Presentation of Belgian Defense and the aerial fly pass over Brussels. 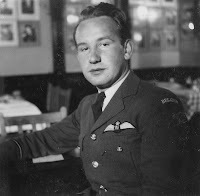 Bomber Boys - BBC Documentary. Brothers Colin and Ewan McGregor follow up their documentary The Battle of Britain with a film exploring Bomber Command, a rarely-told story from the Second World War. 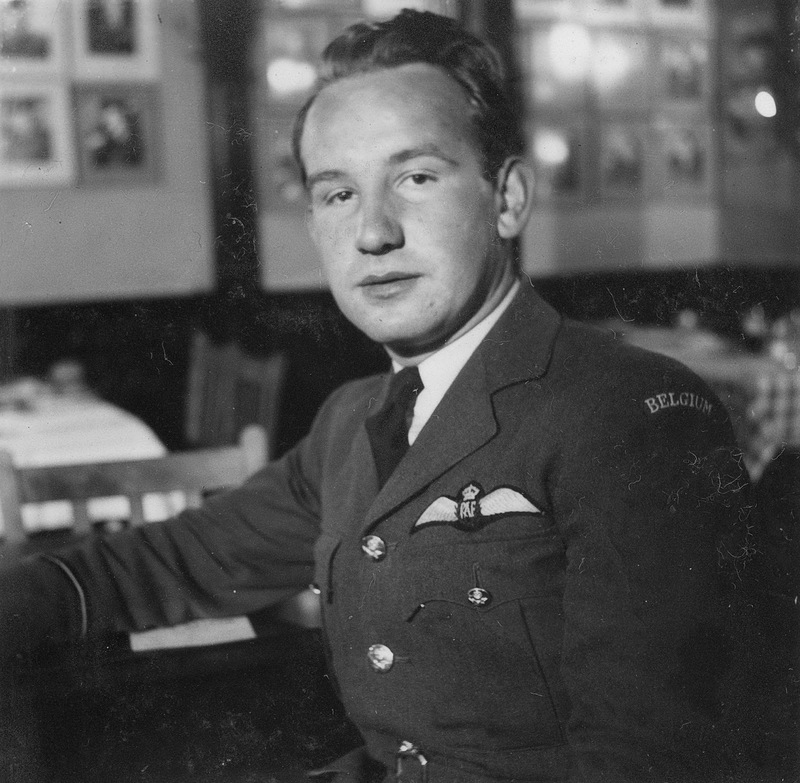 The film focuses primarily on the men who fought and died in the skies above occupied Europe, with numerous examples of individual heroism and extraordinary collective spirit, and Colin learns to fly the key aircraft of the campaign: the Lancaster bomber. But this is also the story of a controversy that has lasted almost 70 years. The programme covers six years of wartime operations, and traces the obstacles and challenges that were overcome as the RAF developed and deployed the awesome fighting force that was Bomber Command. On 28 October Brussels Airlines will launch a new scheduled service to Edinburgh. From then on Scotland’s capital city will be connected six times a week with Brussels Airport. Starting next summer season two daily frequencies will be scheduled. Return tickets are available from 99 euro, taxes included. With the opening of Edinburgh Brussels Airlines adds an important leisure and business destination to its European network. Edinburgh is a vibrant city, hosting a number of exciting events all year. The Old Town, proclaimed UNESCO World Heritage with the famous Edinburgh Castle, the Royal Mile Promenade and the many bars, pubs and restaurants of the Grass Market make Edingburgh a fantastic citytrip destination offering lots of attractions, places to visit and a shopping experience like no other. Edinburgh is also the capital of Scotland. The city houses the Scottish Parliament, and is the second most important financial centre of the UK, after London, due to the presence of many banks and insurance companies. Edinburgh airport is the ideal gateway to discover the city, the peaceful countryside in the Lothians land and the surrounding green scenery in Scotland. This year, Edinburgh airport was awarded for the second time “Best European Airport” in the category 5-10 million passengers. As from 28 October Brussels Airlines will fly six times a week from Brussels Airport to Edinburgh Airport. From summer season 2013 onwards the airline will even offer two daily flights. Passengers have the choice between 3 travel classes : b.business and two economy class formulas: b.flex and b.light. A return ticket in b.light economy is already available as from 99 euro. Members of the Frequent Flyer Programme Miles & More can earn and redeem miles on every flight. The schedule allows for perfect combinations with other European Brussels Airlines destinations s.a. in Germany, France, Switzerland and Spain. 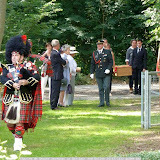 During a ceremony full of emotion, Charles de Hepcée came back home in Braibant near Ciney after being missing for 70 years. 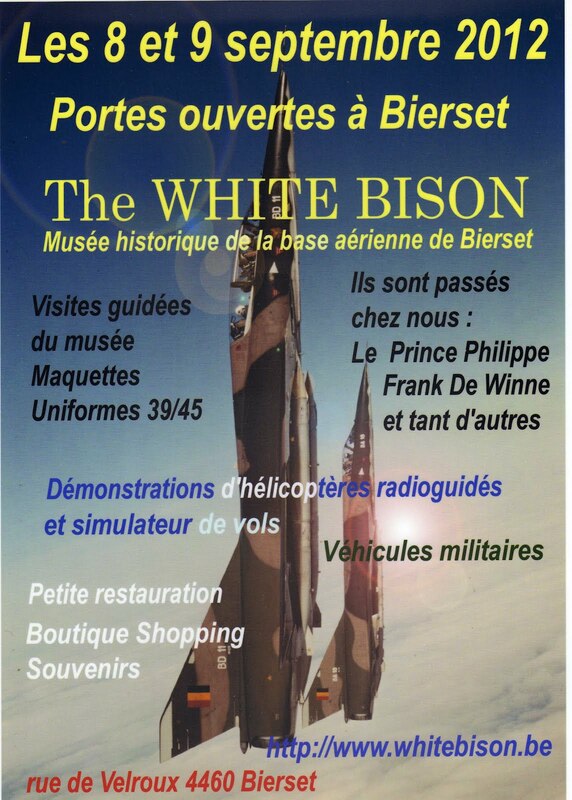 The Belgian Air Force (Comopsair) took an important part in this event by the presence of authorities and of young pilot trainees who are today members of the squadron, Charley de Hepcée was commanding in 1940.Thanks to Mehdi for sharing his pictures. Bonsoir, les enfants. Voici mes photos et ma vidéo de cette merveilleuse cérémonie en mémoire de Charles de Hepcée. Passez une bonne soirée. Mehdi. Vous êtes invité à consulter l'album de Mehdi. Cet album contient 139 fichiers. - Full membership is not only about download, it is about supporting the Avialogs project too and it is only 14$/Year. - Forum is down for maintenance for a few days. If you published documents, they are no more visible but should be online within the week. This week, the EAA convention is starting in Oshkosh and celebrate 75 years of Piper Cub. C'est à bord d'un Alpha Jet, comme co-pilote, que notre journaliste Yannick Hallet a survolé la tribune royale lors de la fête nationale belge du 21 juillet. Close: 1 > 17 september 2012 due inventarisation. 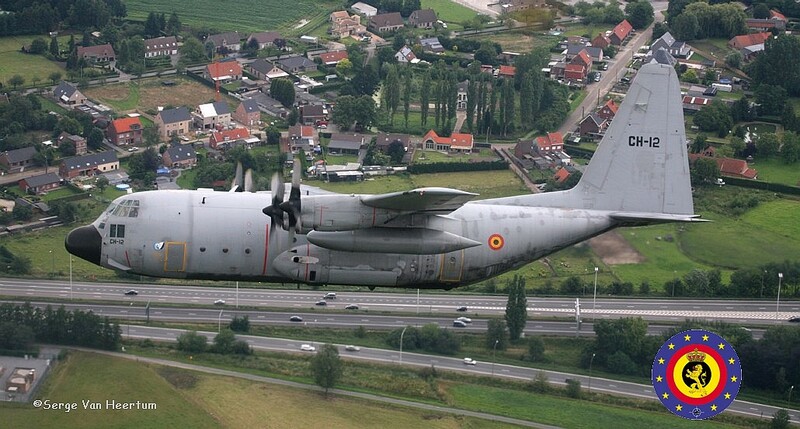 a remarquable Belgian Air Force participation. to be able to make a full report on their show.